Every year, a group of pharmacy students from Kobe-Gakuin University in Japan, one of seven international partners of the School of Pharmacy, visit Duquesne University to learn about the American healthcare system and experience American culture. 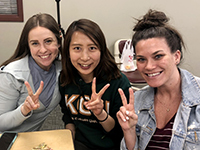 School of Pharmacy student pharmacists act as pen pals and exchange letters and gifts with the Japanese student pharmacists throughout the academic year and serve as hosts during the visit. PYIII Anna Zuschnitt enjoyed meeting her pen pal Ayumu and showing the students around campus and the city. My pen pal, Ayumu, and her friends really wanted to go shopping in America, and they wanted 'American' food so we spent time shopping in Pittsburgh and went to Burgatory for burgers and shakes," Zuscnitt said. "The (Kobe-Gakuin University) students also had a farewell ceremony at which they taught us about Japan and traditions and customs that they practice. It was very cool to see cultures collide!